Here’s Part III on getting through a long writing project without your personal Moriarty, your Inner Critic derailing you. The key is… you know he’ll show up. And you plan ahead. Get ready to vanquish that insidious inner voice telling you to stop writing — the Moriarty of our writing life. In the last post about getting through your NaNoWriMo, I introduced this “voice” and his/her evil powers. The loftier and lengthier your writing goal – a novel? a screenplay? the more insistent, and the more frequent your Moriarty “visits” may become. The stakes are higher and there’s more opportunity for him to slip in and undermine you. And yet you must carry on… or Moriarty has won. 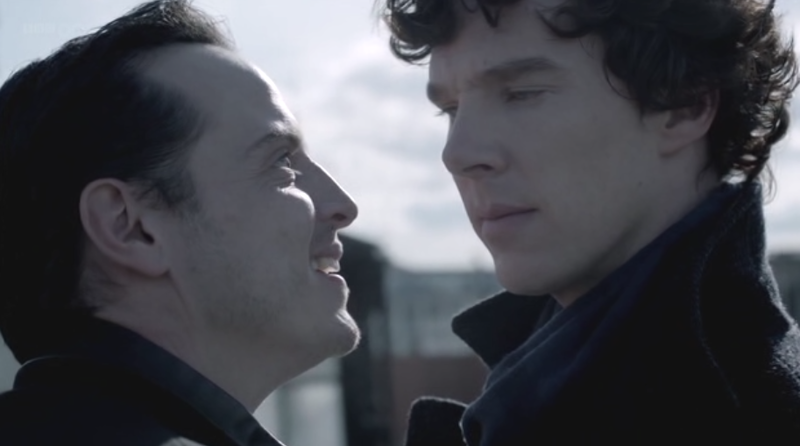 In my post NanoWrimo Part 2 I talked about the first step …really get to know your Moriarty. Employ the careful observation of detail, classic Sherlock Holmes advice. Next you’ll turn to the martial arts. Remember that the Inner Critic is more powerful than you. Martial arts were designed to take on an enemy or a group of enemies who would otherwise overpower you. 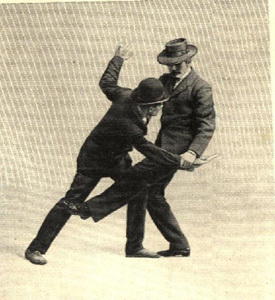 Sherlock Holmes in Arthur Conan Doyle’s works was a master of the Art of Bartitsu. (Misspelled in the canon as “Baritsu” by the way). This was a Victorian martial art that combined stick fighting, boxing, jujitsu, and savate (a type of kickboxing), with a few other ideas as well. It was how a gentleman could defend himself against an attacking ruffian. It used all four limbs, one’s walking stick or umbrella —-and the techniques of distracting, unbalancing, and surprising the opponent. It worked against armed or larger opponents or even a group. (See film example below). Here’s how to employ a little mental Bartitsu against your Writer’s Moriarty. In martial arts, one of the major tactics is to use your opponent’s own weight and momentum against him. Your attacker will lunge at you, will strike at you, will come on full force. Instead of a straight block, what you need to do is go with that movement, pulling him off balance, and then completing that movement to unbalance him and get him where you want. 1. Acknowledge. 2. Agree it might be true. 3. Return to task. M is Moriarty. Y is You, the writer. Say you’ve set yourself a goal to get 1667 words of your novel done in this session before stopping. Moriarty begins tugging on your sleeve. M: Oh man, this is crap. You’re not “on” today. You should stop right now. Y: You might be right that this is crap. I’m going to finish my session right now and look later to see if it is crap, and how crappy it might be. M: Save yourself the trouble. You are wasting time. Y: I might be wasting time. But I’m going to finish my word count now, even if it’s a complete waste. M: What made you think you could do this? You’re an idiot. Y: Yes, possibly. Dumber than dumb. But I am going to finish this session now. M: Stop or I’ll make you stop. (or I’ll make you shoes, if your Moriarty is especially dramatic). Y: You are very powerful. You can probably make me stop. But… I’m going to finish this session first and then we can discuss. M: You’ll never write a novel. Stop. Now. Y: You could be right! Let me get back to you on that. Meanwhile I’m going to finish this session. M: Look how stupid it is. That bit about jujitsu is all wrong. Y: Yes, thank you. I’ll come back to it later to check. Meanwhile I’m going to finish this rough draft session. M: That pile of laundry! What a mess. Fold it, you’ll feel better. Y: Right! I’ll get right to it after my writing session. M: You’re hungry! You need strength to continue. Have a snack. Y: Yes, I am feeling hungry! 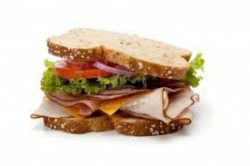 I happen to have a sandwich right here at the ready and I’ll eat it while I continue this session…. Notice that your Moriarty will raise the stakes, change his tactic, get more insistent. You must: 1. Acknowledge. 2. Agree. Then… 3. Go back to the writing. Do not skip any of these steps. Planning ahead may involve having food and drink nearby so you don’t stop for these. 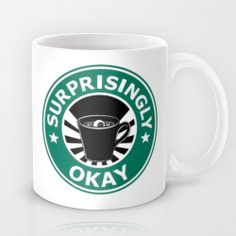 Maybe coffee, too. Some of you may recognize that what I’ve described above is exactly one of the key techniques of a popular technique that surfaced some years ago…Assertiveness Training. It’s how you deal with a bully. And your Writer’s Moriarty is absolutely a bully. Every time you acknowledge your Moriarty and return to task you strengthen your resolve. It gets easier. But don’t let your guard down. He’ll be back. Maybe even stronger. But you’re stronger too and now you know what to do. Rinse and repeat. Next blog… The Power of Negative Thinking… the pact with the devil that can trump your Moriarty. And here’s a book about Assertiveness Training which embodies the idea above and applies it to other situations. Bonnie, I enjoyed reading this post very much! I’ve certainly done numbers 1 and 2 plenty of times while writing but never done 1, 2, 3, and repeat! What a great and simple strategy for getting the words on the page. I laughed out loud about the laundry comment and how M was trying to appeal to our emotional side “you’ll feel better” if you fold it, that is! Great post!